I might put it away in favor of bigger needles for a few days, maybe a week or so. The urge to finish versus how it makes my hand feel, not a great result. So I’ll have something on bigger needles to work on, and because I want to knit things for my niece’s baby, I started this adorable baby doll top in worsted weight yarn and size 9 needles. Lately I’ve been plodding away at my small-needle WIPs, which I can only work on for a few rows at a time due to carpal tunnel. 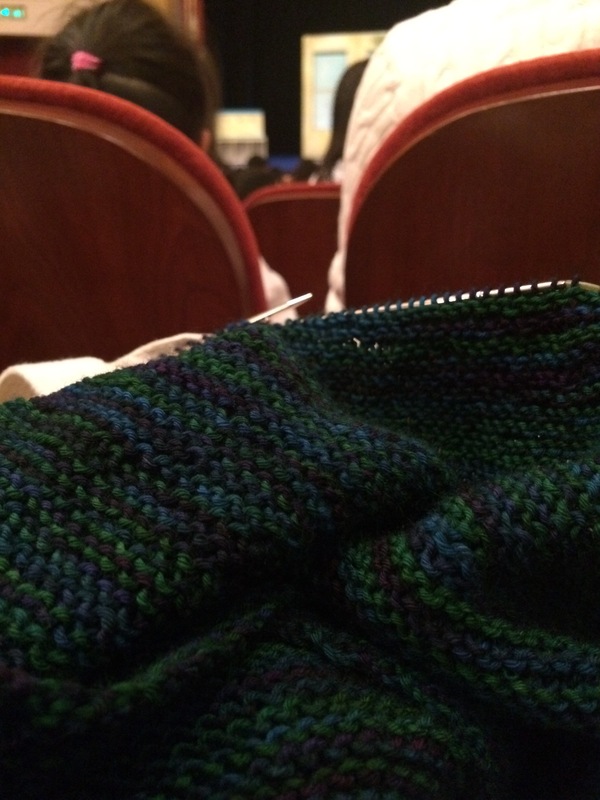 Case in point: I knitted one measly row while waiting with the Wee Girl’s second-grade class for a play to begin. 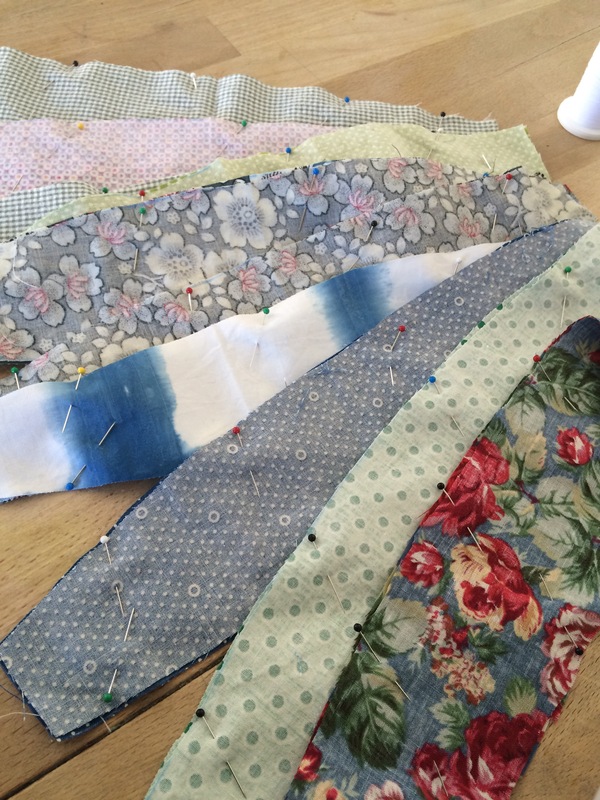 One or two rows at a time, it’ll eventually get done! 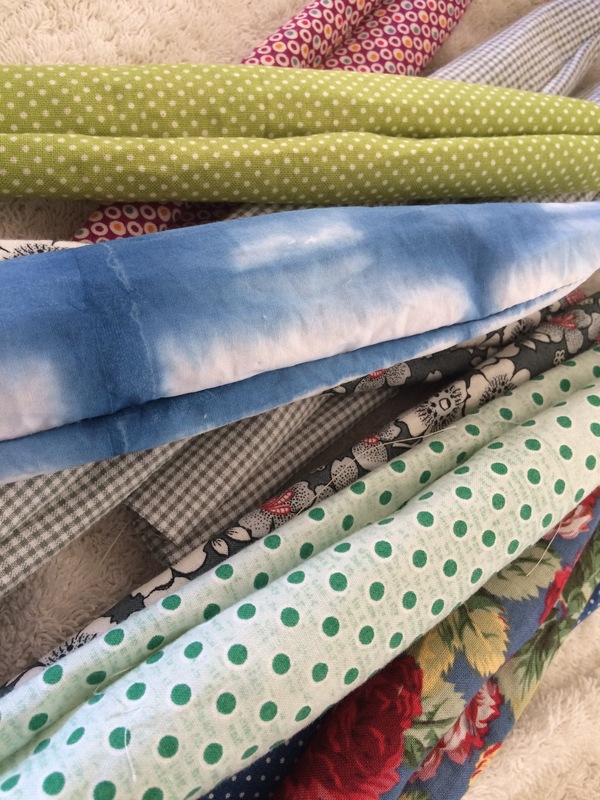 But I’m afraid I might have to really stuck with larger needles from now on. 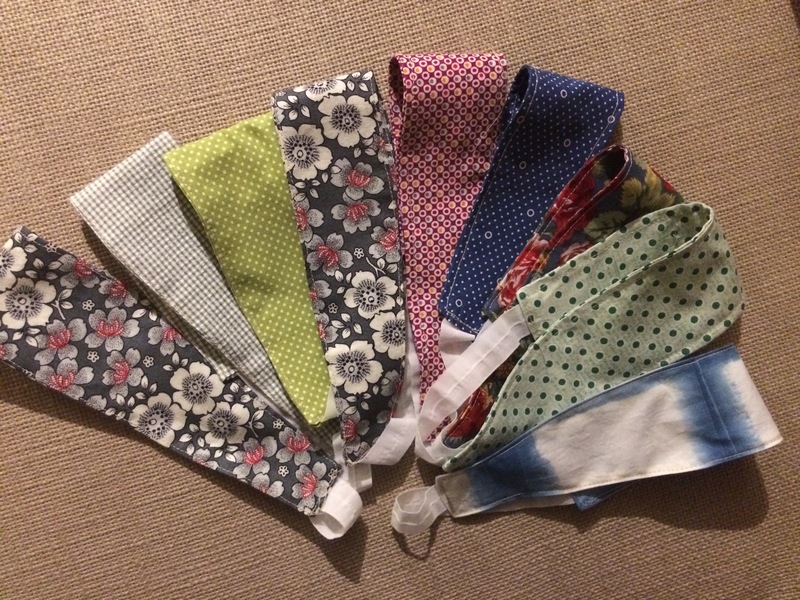 A little sewing project has been going on here- I decided to make a couple of bundles of headbands for our elementary school’s fundraising auction. They won’t bring a ton of money, but it’s nice to contribute something, especially since I didn’t work on the class project this year. there were supposed to be 10, but i made a mistake on one and am wondering whether to fix it or just go with two sets of 4 instead of 5 per set. 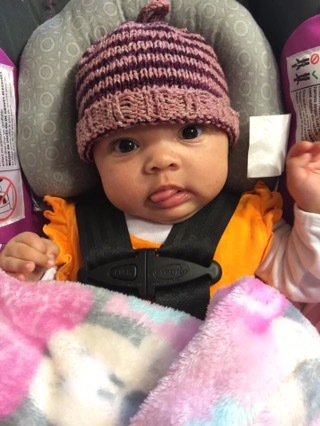 And in cute baby news, here’s my cousin’s granddaughter in one of her Magic Coffee Baby Hats. 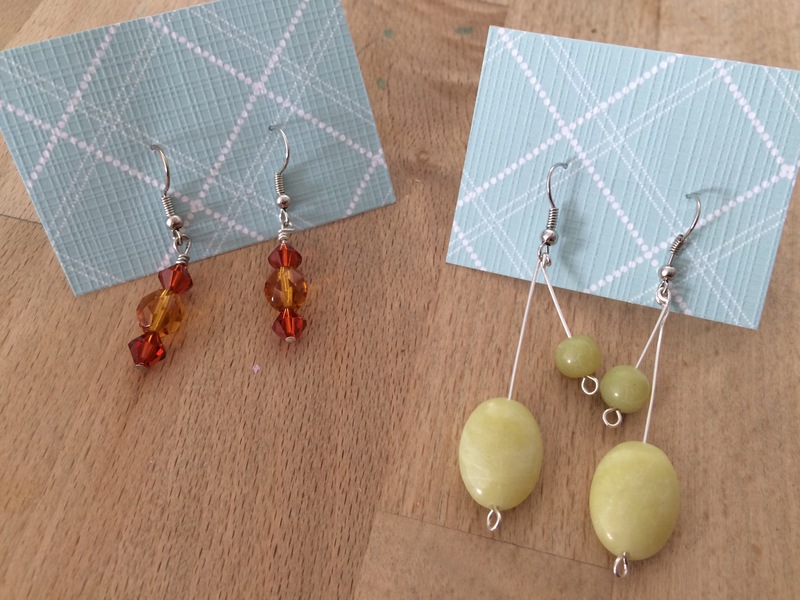 Luckily, my husband took the Boy out just long enough this afternoon for me to whip up a couple of pairs of earrings as a gift. i like to cut up old greeting cards when i gift them- they are secured and look nice to boot. The tea was lovely, and I think it was fun for the Girl to experience some of the desserts she’d read about in Harry Potter, even if they were not quite authentic, according to our English birthday mum. It was fun nonetheless! 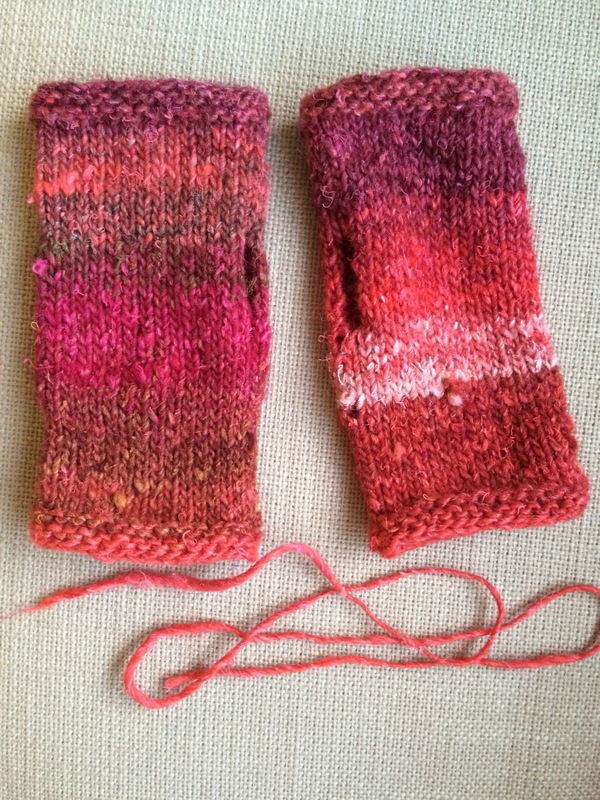 Today I finished my second pair of Silk Garden mitts. Only that tiny bit of yarn was left. However, I’d cut out a section of gray/brown to keep them light and more on the red side. So I only used 35 grams of the 50 gram ball. Maybe you can see a stitch sticking out? I’d dropped a stitch a few rows after the thumb hole. 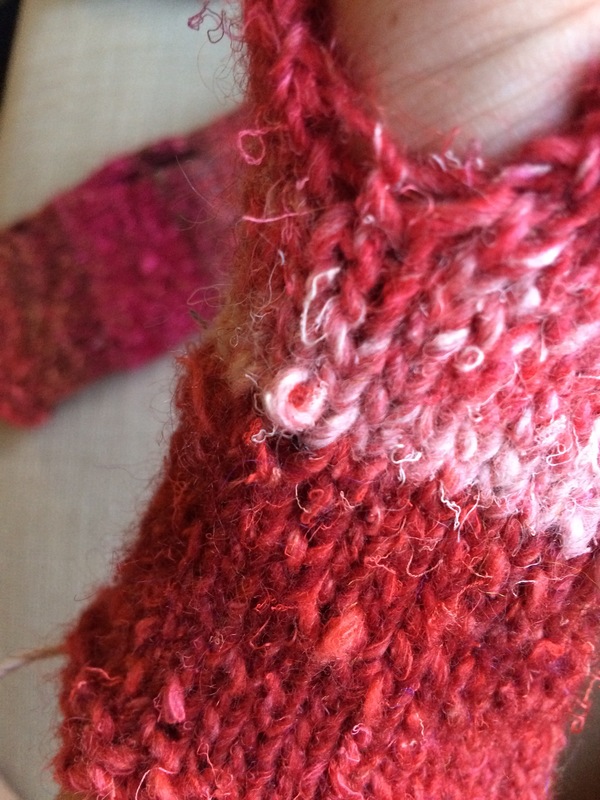 I tinked back to the mistake and re-knit the mitt from there. Haha, JK, I’d never do that! I secured it with a spare bit of yarn and called it a day. 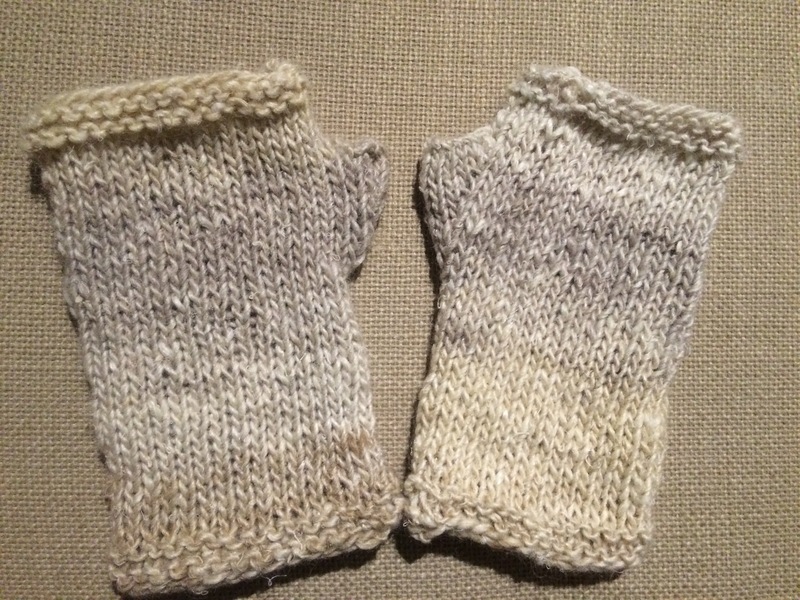 The cream colored mitts I made turned out biggish. Here they are post-blocking. 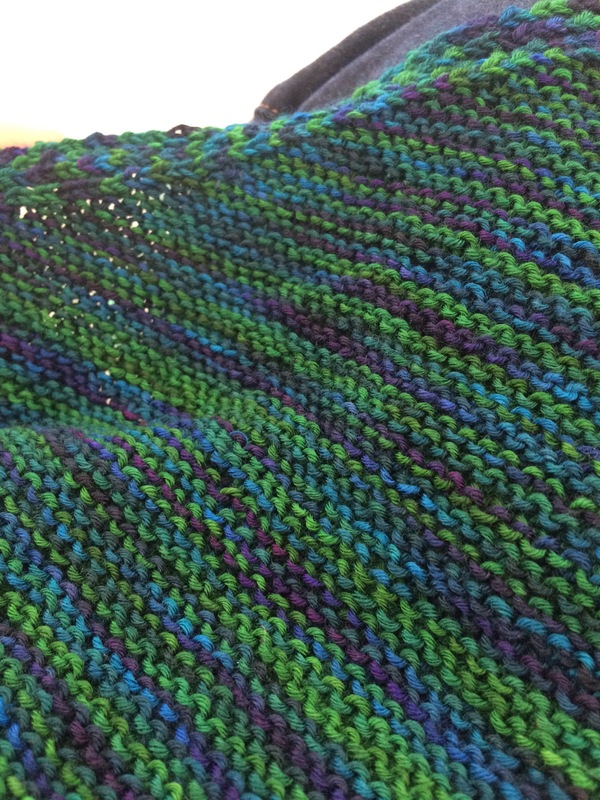 The Girl chose another color way for the re-knit. Fingers crossed that the size works out this time! Smaller needles, fewer stitches, should be ok.
I’ve barely used my spinning wheel since my carpal tunnel started acting up in February. The pinching motion isn’t great for my hand and wrist. But, due to lots of rest and acupuncture, I’m feeling much better and took out my wheel today. 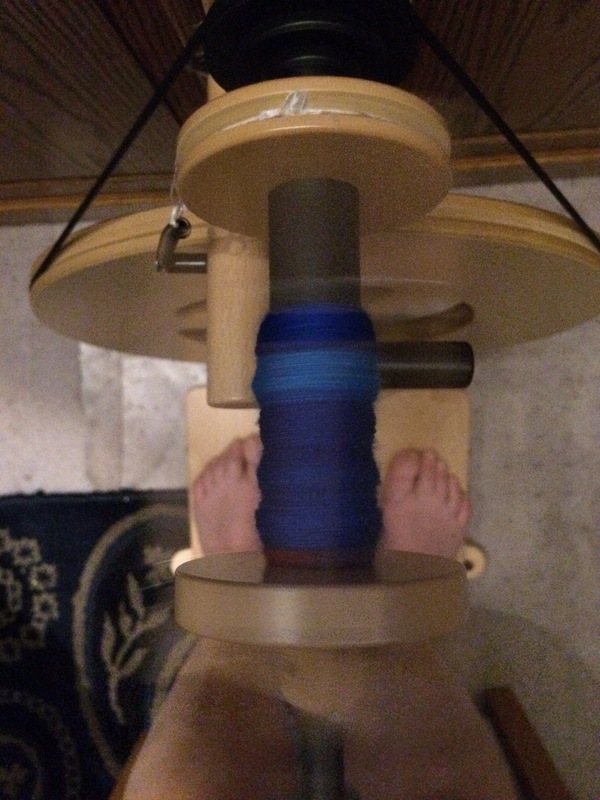 I’m on bobbin 4 of 4, so reaching the end of the singles spinning. Yeah! 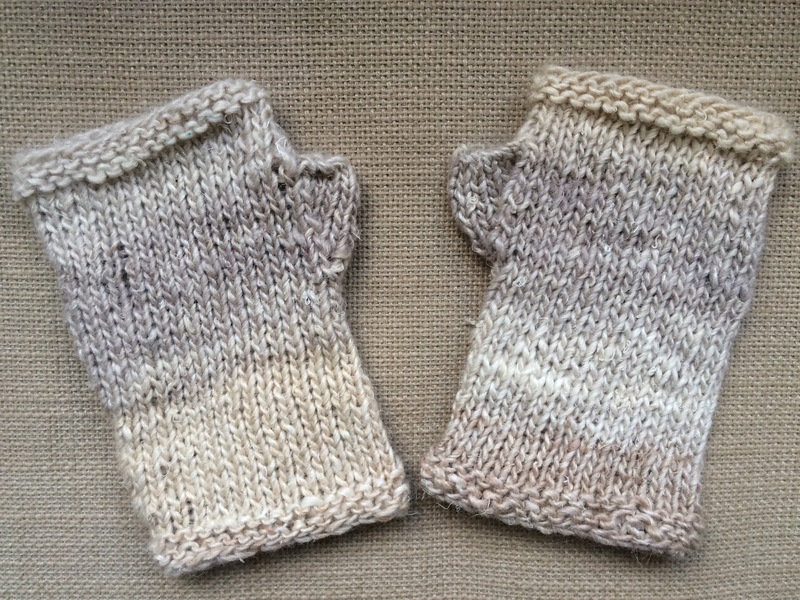 When I made a recent pair of fingerless gloves for the Girl’s assistant teacher who taught her many, many baptism classes, the Girl thought I needed to make some for her main teacher as well. Well, OK! 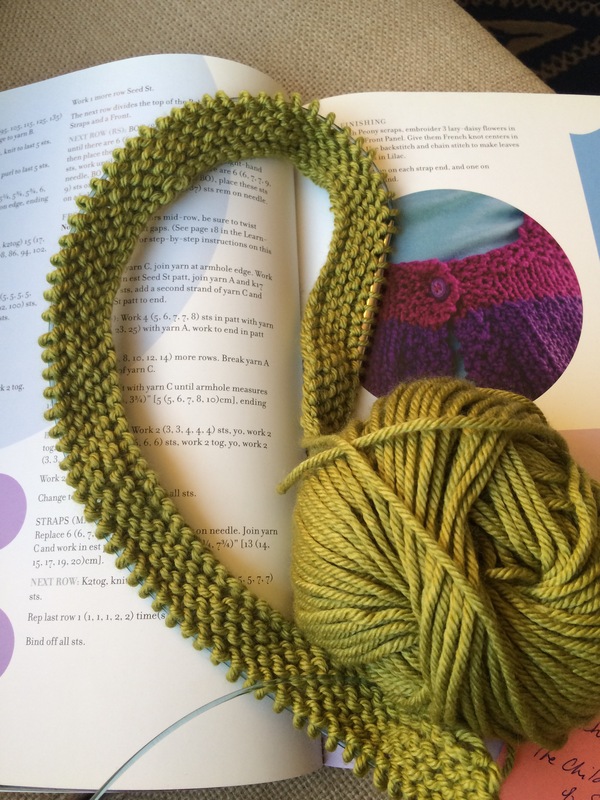 I can knit more without much prodding! 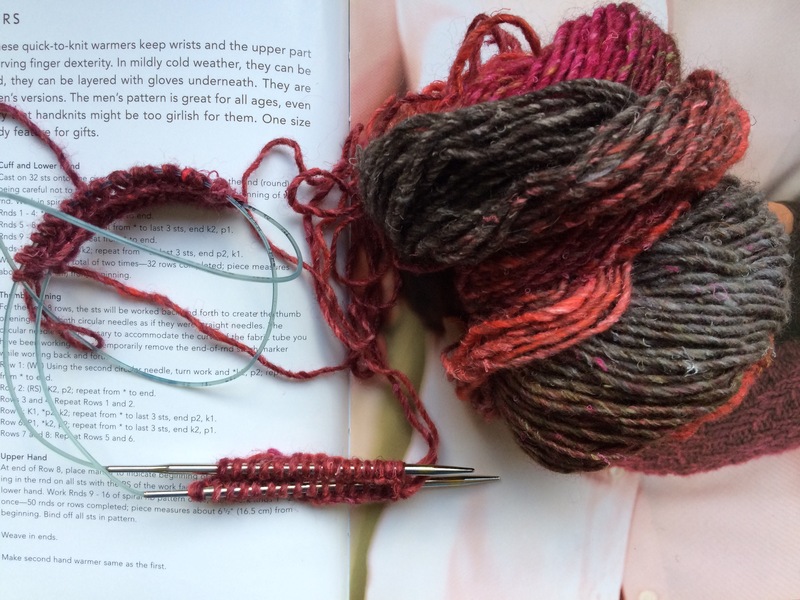 I chose a skein of Noro Silk Garden, because I had four skeins of it from an abandoned project. Also, I had chosen a super special yarn for the assistant teacher- Devbie Bliss Cashmerino Aran, and because the assistant had done so much for the baptism, I didn’t want the second mitts to outshine the first, ya know? The skein I chose was beige-ish. Still very special and pretty. 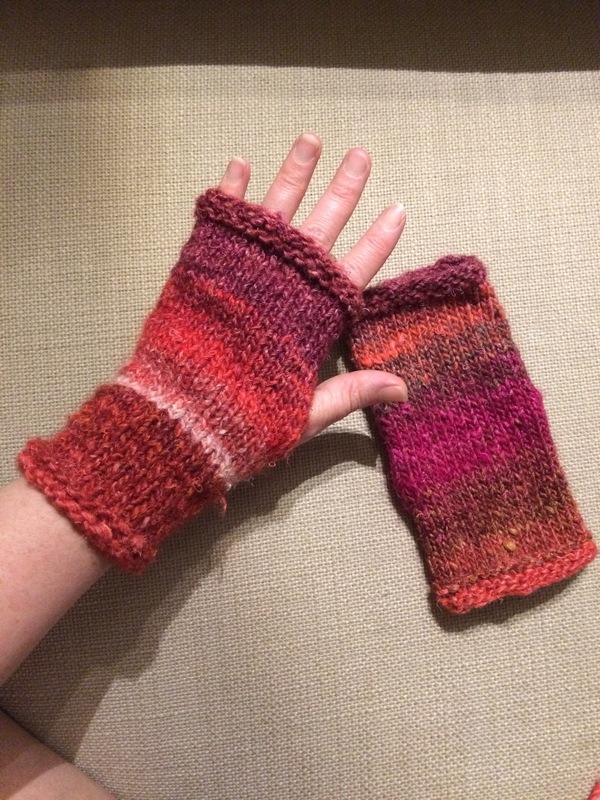 Tonight I finished the mitts! I’ll block them, which should fluff them up a bit. I like the subtle asymmetry of the colors. Most likely I’ll have the Girl gift them to her teachers after First Communion, which is this weekend!